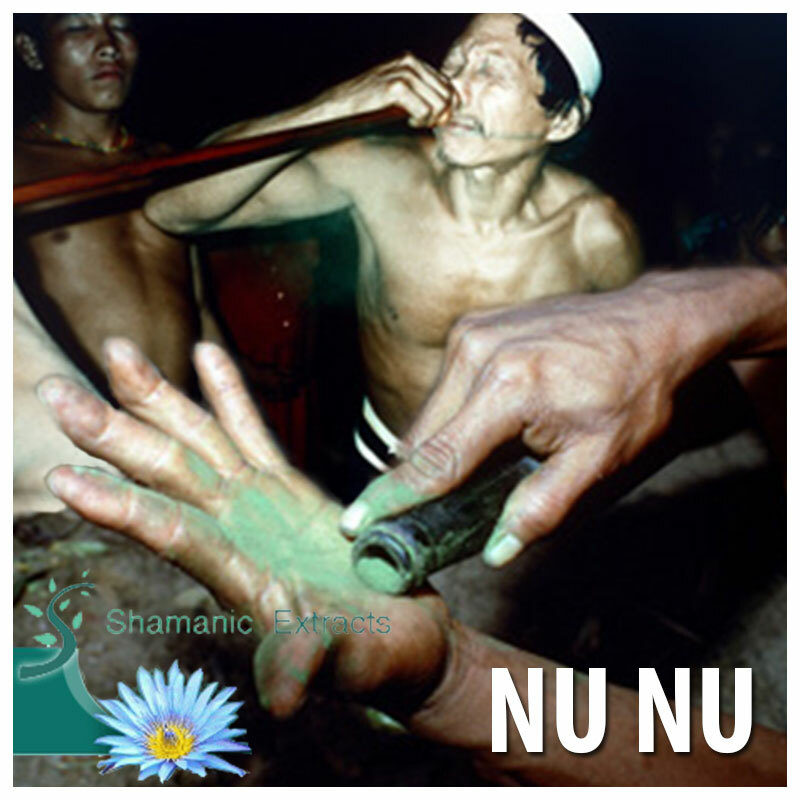 Nu-nu is a psychoactive snuff which comes from the Amazon region in Peru and is used by the Matses, who also use kambo or what they also refer to as sapo, meaning frog in English (it's a venom, secreted from frog, combined with spit, put on a stick and then used to burn marks in the skin. I have two friends who've done it and it gives an unpleasant intoxicating effect and makes you vomit. It is used to 'clean' the body and I've also heard vague reports of helping to quit drugs) Both medicines are used in hunting magic and are seen as a medicine. - So what does if consist of? It's a snuff made from toasted, crushed and then powdered nicotiana tabacum (mapacho) combined with the powdered burned inner bark of theobroma sp (bicolor according to a friend). They put the mixture under the ground (I don't know in what they put it) and let it there a few months, when they take it out it's ready to be consumed. It is used the same way yopo is used, through a blow pipe they blow it in each others nose. Then I found this in The Encyclopedia of psychoactive plants by Christian Rätsch on page 504. Theobroma subincanum Martius - cacahuilo. This product is not sold or intended for the purpose of human consumption or cosmetic use. Any information provided about this product on this website, including any links to external websites, are solely intended for historical, scientific and educational purposes and must not be interpreted as a recommendation for a specific use of the product. The statements contained herein have not been evaluated by the Food and Drug Administration and the product is not intended to "diagnose, treat, cure or prevent any disease." The use and application of this product, based on the historical and scientific context provided in the product descriptions and articles, is solely at the customer's risk. This product is a botanical specimen of ethnographic value and interest only and is delivered with no express or implied fitness for any purpose. The product descriptions are compiled from sources we deemed to be reliable up to the date it was written but may contain omissions or errors in fact, or become outdated. It outlines the documented history of uses but should no way be construed to make any medical claims about the ability or efficacy of any of these plants to treat, prevent or mitigate any disease or condition. Although a plant may have a long history of being used for a particular purpose, scientific evidence proving its efficacy for that purpose may be lacking. Two of the most effective medicines used in hunting are Nu-Nu (a hallucinogenic snuff) and Sapo, or Kambo (a preparation of frog secretion mixed with spit and burned into the skin). When hunting is poor even with the use of Nu-Nu, the more powerful Sapo is utilized. Nu-Nu is a snuff made from toasted, crushed and finely powdered Mapacho (Nicotiana rustica) leaves, combined with the toasted, crushed and powdered inner bark of the Macambo tree (Theobroma bicolor), a member of the Cacao family. And is infused with the spirit of the maker of the drug. Both trees are so vital to the Matses' life that when they are searching for a place to build a new puebla, both trees must be within a few hours walk of the intended home; their presence assures the Matses that the surrounding jungle will be benevolent. Nu-Nu is a vision drug. A "giver" puts a little of the powder into one end of a hollow bamboo tube; the "user" puts the other end of the tube to his nose. The powder is then blown into the user's nose, where it explodes into his face, burning his nose and eyes and blurring his vision. He chokes up green phlegm and his blood pulses as though his body were short-circuiting. Over and over, the process is repeated until his eyes glaze over and he can no longer stand. Numbness replaces the sharp pain. He falls to the ground and his visions begin. It is not, like Yopo, filled with tryptamines, and isn't psychedelic at all. Nonetheless, at large doses, maybe 14 half-gram bursts blown up your nostrils, there frequently comes a point--after the pain subsides--where you see something like a television screen and across it you'll see all of the animals of the jungle running. Tapir and peccary, monkeys and jaguars. The user sees himself walking in the jungle, and the animals there come to him. He communicates with the jungle animals, telling them that he is hungry and they are needed for food. He announces his intentions for hunting them and notes the location and time of day he sees them. Within a few minutes, the visions fade and a pleasant drunkenness washes over the user. If the Nu-Nu was especially potent, the visions may return unexpectedly for hours. In the morning the hunter will go to where he "saw" the animals and wait for those he spoke with. When they arrive, he hunts them. The Matses believe that the animals are offering themselves freely to the slaughter. The Matses say the jungle taught them the secret of Nu-Nu. In return, they never cultivate the plants whose leaves and bark are used in its preparation. They fear angering the animal spirits by having too much of an advantage over them. The old Matses, the antiguas, say the animal sees the vision of their death as well, and still comes to the spot to die as that is its fate. Nu-Nu and Sapo allow the Matse to experience the future, and communicate with the spirits of plants and animals. Specific predictions that constitute scenarios for hunting in a future time are captured while walking the future time track under the influence of Nu-Nu or Sapo. These predictions then manifest as experiences that occur in this â€˜worldâ€™ when the hunter soon thereafter follows the trail and signs that were revealed to him when in the future, and he then concludes his journery with the successful hunt that was foretold. One of the keys to making the Nu-Nu effective, say the Matses, is that the person blowing the Nu-Nu is also blowing his spirit and strength into you--not as in giving it away, but as in empowering you with his force as part of the force of the experience. So it's not just how hard you can blow, it's whether you can share yourself while doing it. And the Nu-Nu is generally, or frequently, made by two great hunters--one working the leaves, the other the bark--before they're combined to give some of their force to it as well. It is not only used in hunting, but also for curing diseases, both physical and spiritual (a distinctly shamanic practice); sometimes it is used for celebration or just to get a good night sleep after a bad day. Share your experience about Nu Nu with other customers. Submit your tips or thought on this product, be detailed and specific.